Were You Hit by a Negligent Driver on I-80? Driving on interstate highways is often a part of everyday commutes for most people in the United States. Unfortunately, these are some of the most dangerous roadways that a driver can be on. Interstate 80 runs across the state of Pennsylvania and is considered the seventh most dangerous highway in America. Accidents that occur at high speeds, such as those traveled on I-80, tend to be more serious and result in more consistently serious injuries and death. If you have been injured— or have suffered the wrongful death of a loved one — due to negligence displayed by a fellow motorist, truck driver or poorly maintained roadways, then you deserve to be compensated for past, present and future damages. 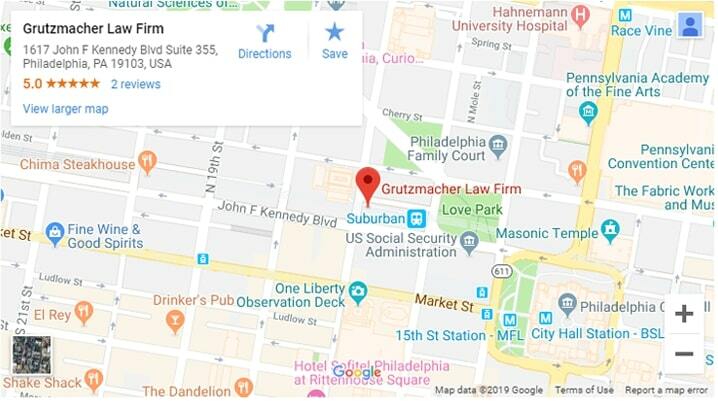 Founder and principal attorney, Adam E. Grutzmacher, knew that he wanted to help people when he opened the doors to his Philadelphia personal injury law firm in 2003. Since dedicating his career to representing the wrongfully injured, Adam has helped garner the largest settlement ever recorded in Pennsylvania history when a Salvation Army building collapsed, injuring and killing several people in 2013. Adam knows the kind of stress that an accident can have on an injured person and his or her family. He will quickly build a case that protects and advocates for you as well as represents your best interests. What Are the Most Common Causes of Highway Accidents? Vehicle defects. Sometimes the accident is not caused by a vehicle driver, but rather a defect in the design or vehicle part. In these cases, you can often hold the vehicle’s manufacturer liable for any injuries sustained. These defects often force the manufacturer to execute a recall, but oftentimes it is already too late and some people have been affected by it. The most common types of vehicle defects include faulty headrests, defective airbags and malfunctioning seat belts. Speeding. We are all trying to get to our destinations as quickly as possible in this day and age of convenience. Across America, speeding — which can also often be attributed to aggressive driving, or “road rage” — is often a factor in the most serious of vehicle accidents. Vehicle crashes, especially those involving larger vehicles like semi trucks and buses, at high speeds often result in more instances of catastrophic injury and wrongful death. Distracted driving. Since the invention of the smartphone, motor vehicle accidents due to distracted driving have been on the rise. According to the National Highway Traffic Safety Administration (NHTSA), distracted driving (which includes eating, putting on makeup and fiddling with music options while driving) claimed “3,450 lives in 2016 alone”. Over 300,000 more suffered serious personal injury. These and other elements can be determining factors in your I-80 accident claim. An experienced I-80 accident attorney in Philadelphia can examine all the details in order to build the strongest case possible. Who Can Be Held Liable in an Accident on I-80? Several different types of vehicles travel on our nation’s interstates every day. As such, it might be confusing as to who can be held responsible should you get involved in an accident with a company vehicle or due to poor road conditions and suffer a personal injury. For example, if you were involved and subsequently injured in an accident with a semi truck, charter bus, UPS/FEDEX or other type of company vehicle, it may be possible to go after the company as well as the individual driver and other potential parties (such as maintenance workers), depending on the unique details of your case. However, the larger the company, the harder the legal opposition will come down against you. These companies will likely have a sizable retainer of lawyers on hand whose sole job will be to see that you receive as little compensation as possible. For this reason alone, it is in your best interest to seek professional legal representation that will be on your side. On the other hand, if the accident was caused by poorly maintained roadways, unmarked construction zones or debris present on the road and resulted in injury, then the injured person(s) can file a claim against the local government entity responsible for that roadway. However, when pursuing legal action against the government, you will have to fight through a lot of red tape and bureaucracy meant to discourage you from continuing the fight. For example, the government is protected from being held liable in many instances due to “sovereign immunity”. This basically means that a person’s ability to pursue legal action against the government is extremely limited. Thankfully, there are reasonable exceptions to sovereign immunity in Philadelphia per the state’s Sovereign Immunity Act. In either of these circumstances, it is highly recommended that you seek an experienced I-80 accident attorney as filing a claim against a large company or government entity is extremely difficult. Being in a serious accident is a stressful situation. Emotions run high and people become injured — even die — due to highway accidents that are often largely preventable. If you or a loved one were injured due to the negligence of another driver or government entity, then our experienced I-80 accident lawyer, Adam, can help you. In the end, he wants you to walk out the doors of the Grutzmacher Law Firm with better peace of mind about the future. That peace of mind starts when you come in for a free consultation to discuss the details of your case. Adam will sit down with you and listen to your situation in great detail. He will let you know how he thinks you should proceed. If you decide to work with our Philadelphia personal injury law firm, Adam will get started working on your case right away. Call (215) 261-7975 or contact us online to schedule your free consultation today.